"He is not a monster. I'm his daughter. I know him better than anyone." Imagine for a moment that the father you have loved, respected and admired all your life is suddenly accused of some of history's most horrific atrocities�acts so brutal and unconscionable it's impossible to associate them with the parent you adore. Yet, as a highly regarded attorney, you are entrusted with his defense, and must weigh family ties against professional ethics as you seek to exonerate him. Do you defend him blindly or seek the truth, however painful it may be? Do you deny the facts, or twist them to fit your vision of a noble father? When do you stop being the devoted child and start being the tough-minded lawyer? Can you be both at the same time? Which one are you first? 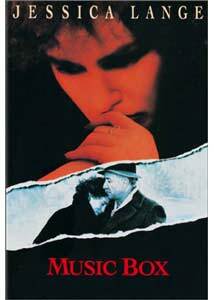 Such are the dilemmas Ann Talbot (Jessica Lange) faces in Costa-Gavras' riveting drama, Music Box. And just as Ann must balance divided loyalties and emotions, Costa-Gavras performs his own cinematic juggling act, intertwining combative courtroom scenes with the subtle complexities of family relationships and the suspense of historical detective work. Despite the tall order, none of these elements are left dangling. Music Box succeeds on every level, thanks largely to Lange's intimate and gut-wrenching portrayal of an attorney who must question not only the integrity of her client, but also the inner soul of the man she has looked up to all of her life. Written by Joe Eszterhas (his final film before Basic Instinct, million dollar salaries, and career-crippling egotism), Music Box follows Ann's quest to clear the name of her father, immigrant Mike Laszlo (Armin Mueller-Stahl), who is accused of joining a Hungarian death squad known as Arrowcross in the latter years of World War II. Organized by the Nazis, this militant group operated under the aegis of Hungary's national police and maintained order through systematic, cold-blooded terror. Yet for more than 35 years, Mike has lived an exemplary life in America. He built a successful business, dotes on his grandson and takes pride in his U.S. citizenship. At first, Ann laughs off the charges as a simple case of mistaken identity, but her outrage turns to denial and then dread, as tiny cracks in her father's case begin to shake her belief in his innocence. As prosecutor Jack Burke (Frederic Forrest) tells her, "You trust in your heart, it's going to get broken." Costa-Gavras, whose previous work includes such similar�and equally successful�socio-political mysteries as Missing (1982) and Z (1969), lends the film a drab, gritty look, mirroring the characters' conflicts. A master of understatement, he wisely lets the story tell itself, brilliantly orchestrating the various elements, but refusing to bog down the narrative with clever directorial tricks. Still, he creates quiet, yet palpable, suspense. When he does indulge himself with an arty or symbolic shot, it's easy to miss�a glimpse of Lange in a three-way mirror speaks volumes about her character's predicament, split loyalties and search for self. Lange received a well-deserved Academy Award� nomination for her portrayal. Her slow realization that her father may not be the man she thought he was�and something far worse than she could possibly imagine�is movingly rendered, and Lange handles her character's various guises (cocky advocate, loving daughter, ethical jurist, reluctant detective) with seamless skill. A fine foil, Mueller-Stahl keeps the audience guessing regarding his character's true nature, making it just as difficult for us to believe the charges against Laszlo as it is for Ann. Complex, richly textured films featuring excellent performances, restrained direction and a tight, thought-provoking story are rare�and deserve more attention than they invariably get. The moods and themes of Music Box may not be haunting, but they certainly linger long after the film ends. Image Transfer Review: For all the care Costa-Gavras must have lavished on Music Box during the film's production, it's a crying shame that Artisan didn't see fit to devote even a fraction of that attention when transferring the movie to DVD. Inexplicably, a full-screen, pan & scan version is all that's included�and a lousy one at that. Cropping is horrific. The actors' faces are often sliced in half, and dead space consistently dominates the frame, as characters wander in and out of shots in mid-conversation. Even a nonanamorphic widescreen option would be far preferable to the full screen mess Artisan has foisted upon us with this release. The source print betrays the film's age, with specks and grit frequent intruders. Backgrounds are often unstable, flesh tones vary, and patterns regularly shimmer. It's a tribute to the film's overall quality that it can withstand such shoddy treatment�but only barely. It's hard to concentrate on and appreciate Music Box and its nuances when the visuals distract and annoy so much. Audio Transfer Review: Sadly, the audio suffers from the same production apathy that afflicted the video. Music Box is a dialogue-driven film, and while the actors do whisper and mumble often, it's the job of a good audio technician to clean up the track enough so they can be understood. I don't remember straining to hear dialogue when I saw the film in the theater upon its initial release, but at home I found myself constantly raising the volume�and to no avail. The Dolby 2.0 mix is muffled and flat, sounding more like mono than stereo, with practically no movement across the front speakers, although the often striking score by Philippe Sarde comes through nicely. Once again, it's hard to immerse yourself in a gripping drama when you're forced to constantly re-watch segments to clarify dialogue. Extras Review: Zip. Zilch. Nada. No trailer, not even subtitles. Of course, with such poor sound, I'd consider English subtitles not just a big bonus, but a necessity! A "making-of" documentary and/or audio commentary would have added depth and perspective, but maybe the cast and crew are waiting for a more definitive release. I certainly can't fault anyone for their absence here. A multi-layered story, debatable moral issues, an absorbing mystery and terrific performances by Jessica Lange and Armin Mueller-Stahl all make Music Box affecting and memorable. Unfortunately, a slipshod video transfer, muddy audio and zero extras make it impossible to recommend this Artisan release.